Because High Performance buildings, like Passive Haus homes, are so air tight, the quality of the air within is a critical consideration. Whether we are at home, at work or in other public buildings, we are exposed to many indoor air pollutants. These pollutants can cause minor health issues such as headaches, eye irritation, allergies and fatigue, or major ones like asthma and different forms of cancer. Gases such as carbon monoxide and nitrogen dioxide, known as combustion pollutants, originate from burning materials or improperly vented fuel-burning appliances such as space heaters, wood stoves, gas stoves, water heaters, dryers and fireplaces. Carbon monoxide cannot be easily detected, as it is colorless, odorless and tasteless. It’s a toxic gas which causes headaches, dizziness, weakness, and nausea; and at high levels it can be deadly, hindering oxygen delivery throughout the body. Nitrogen dioxide, another colorless and odorless gas, causes eye, nose and throat irritation, shortness of breath, and increased risk for respiratory infections. Cooking with natural gas emits high levels of Nitrogen dioxide. Many high-performance homes are all electric and there is no “burning” of hydrocarbon products. However, other forms of air pollutants include volatile organic compounds (VOCs) which are defined as invisible toxic gas emissions from solid and liquid sources found inside our homes. These include paints, cleaning supplies, pesticides, building materials and office supplies such printers, glues, and permanent markers. Even a new sofa will off-gas VOCs. Levels of certain VOCs can be 10 times higher indoors than outdoors. Like other indoor air pollutants, VOCs can cause health problems, specifically respiratory and allergy issues in children. It is crucial to combat all these indoor air toxins, but is there a way to have outdoor-quality air indoors? 1. Removing the source of the toxins in our homes and offices: not smoking indoors, by purchasing products that are less toxic, such as those made with natural ingredients, and using them according to the instructions. 2. Reducing the amount of air pollutants and VOCs indoors by cleaning the air with filtration. Electronic air cleaners and ion generators are effective in removing some airborne particles, but not gases or odors, and many of them can produce ozone that may irritate the lungs. Ion generators may remove small particles (tobacco smoke) from the indoor air. 1. Exhaust ventilation system: This system depressurizes the home by exhausting air from the house while make-up air infiltrates through leaks in the building shell and through intentional, passive vents. Exhaust ventilation is best for cold climates. In warmer climates with humid summers, depressurization can bring moist air into building wall cavities and cause moisture damage. It can also bring in pollutants we are trying to remove: radon and molds from a crawlspace, dust from attics, fumes from attached garages and flue gas from a fireplace or fossil fuel-fire water heater and furnace. 2. Supply ventilation system: A supply ventilation system uses a fan to pressurize our home, bringing outside air into the building while air leaks out of the building through holes, bath and range fan ducts and intentional vents. Drawbacks are they do not remove moisture from the make-up air before it enters the house and may contribute to higher heating and cooling costs. If the interior air is humid enough, the moisture in the air can condense and rest in the attic or cold parts of the exterior wall, causing mold, mildew and decay. This system is best for hot or mixed climates. 3. Balanced ventilation system: This system does not pressurize or depressurize our homes. Instead, it introduces and exhausts approximately equal quantities of fresh outside air and polluted inside air. A balanced system is appropriate for all climates but does not remove moisture from the makeup air before it enters the house. This can increase heating and cooling costs. The most efficient kind of ventilation systems are energy recovery ventilation systems, as they provide a controlled way of ventilating a home while minimizing energy loss. They reduce the costs of heating ventilated air in the winter by transferring heat from the warm inside exhaust air to the fresh (but cold) outside supply air. In the summer, the inside air cools the warmer supply air to reduce cooling costs. There are 2 types: Energy Recovery Ventilators (ERV) and Heat Recovery (or enthalpy-recovery) Ventilators (HRV). Both types include a heat exchanger, one or more fans to push air through the machine, and controls. 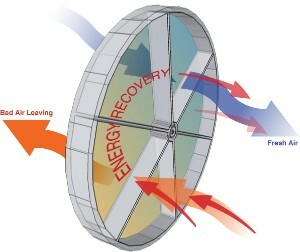 The main difference between a heat-recovery and an energy-recovery ventilator is the way the heat exchanger works. With an energy-recovery ventilator, the heat exchanger transfers a certain amount of water vapor along with heat energy, while a heat-recovery ventilator only transfers heat. In the summer, an energy-recovery ventilator may help to control humidity in the house by transferring some of the water vapor in the incoming air to the theoretically drier air that’s leaving the house. If you use an air conditioner, an energy-recovery ventilator generally offers better humidity control than a heat-recovery system. Most energy recovery ventilation systems can recover about 70% to 80% of the energy in the exiting air and deliver that energy to the incoming air. However, they are most cost-effective in climates with extreme winters or summers, and where fuel costs are high. In mild climates, the cost of the additional electricity consumed by the system fans may exceed the energy savings from not having to condition the supply air. There are some drawbacks: Energy recovery ventilation systems usually cost more to install and maintain than other ventilation systems. Also, energy recovery ventilation systems operated in cold climates must have devices to help prevent freezing and frost formation. Very cold supply air can cause frost formation in the heat exchanger, which can damage it. Frost buildup also reduces ventilation effectiveness. However, the benefits of ERVs far outweigh the negatives. Clean, fresh indoor air is a commodity worth the investment, and the health of our families depends on it.